A couple of months ago, we sent out an open letter to Trulia that detailed our concerns about how we felt the company’s commitment to the real estate community had changed. We cited inaccurate data, confusing (and potentially misleading) placement for advertising, and a lack of attribution to the agents of record on property listings. We hoped they’d listen. And boy, did they ever! We were invited to have some frank conversations with their senior management, including CEO Pete Flint, about how to balance what we saw as fundamental brokers’ rights with Trulia’s business model and their desire to make money. They also launched similar discussions with other brokerages around the country. Instead, they took us all seriously. So seriously, in fact, that they announced in early May that they’re planning an overhaul of their industry offerings. We recently met again with Trulia, and they outlined the specifics of what’s changing — and we have to say we’re impressed. Here’s a summary. Currently, Trulia obtains data from a multitude of different sources, including local MLSs, third-party sites like ListHub, brokerages, and even individual agents. The fallout has been that sometimes the same listing will show up in different places – with different data. Trulia has acknowledged that the ultimate “source of truth” should be broker listings, as long as the brokers’ data feeds meet quality standards. So in cases where there’s duplicate data, direct brokerage feeds will take precedence. And where the brokerage feeds don’t meet muster, Trulia will suggest improvements that will result in the best data possible. Trulia requires that individual agents go into the site and “claim” each of their listings in order to be able to display a photo and contact information. However, that can be time-consuming for agents; further, we argued that our real estate professionals had already earned the right to have this data displayed when they signed their exclusive representation agreements with the property owner. This can be a win-win proposition for brokerages. When a brokerage commits to creating a robust, reliable, comprehensive feed, Trulia gets a top-shelf data source for listing information. And with the autoclaim option, agents don’t have to take an extra step to be displayed on their own listings. A common complaint was that listing agent information was buried – too difficult for a reader to find. 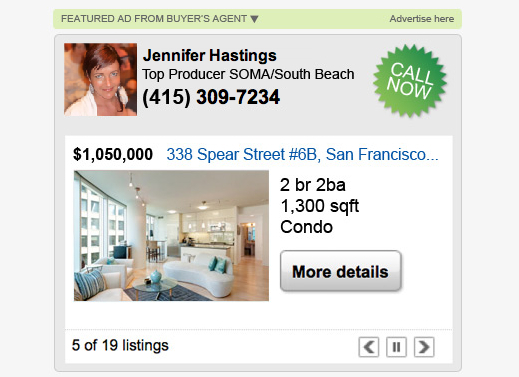 In response, Trulia created better attribution higher up on the page in a much more prominent location. They also will provide the agent’s name, phone number, broker name, address, and phone, as well as a link to the listing on the broker’s site, at the bottom of each listing. One of our biggest concerns was the prominence of advertisements from competing agents on our listings. Those ads, usually head shots, often appeared in such a way as to suggest that agent was actually representing the adjacent property. The challenge here? Advertising is how Trulia makes money. But they acknowledged the pitfalls. They came up with what we consider to be an elegant solution, with two approaches. First, they have removed competing agent and/or broker display advertising on premium (paid) listings. Second, for brokers and agents who don’t sign up for premium offerings, Trulia will clearly identify paid advertisements. Additionally, for claimed listings, Trulia will allow the agent to remove the QuickConnect feature — which displayed the names of the listing agent as well as three competing agents– at no cost, making that agent the sole point of contact for his or her listing. We like it. Trulia can still make money on premium services and advertising, but will make it clear that ads are ads – and provide the opportunity, should we wish, to create a listing environment entirely free of competing ads. The company has committed to better communication with the industry. Options being explored include creation of a monthly newsletter, a broker blog, and enlisting trainers to provide in-house coaching to brokerages on how to get the most out of Trulia. Our source said it’s become clear that Trulia needs to start communicating consistently with the industry, and we love the idea of being kept in the loop on upcoming changes and providing ongoing feedback. We’re pretty pleased with this renewed commitment. And looking forward to seeing what’s next.